This gallery contains collections of photos which were taken by Vietnam Veterans during their tour. The subject matter is varied, and represents images of the people, places, and things that the Veterans considered important at the time. 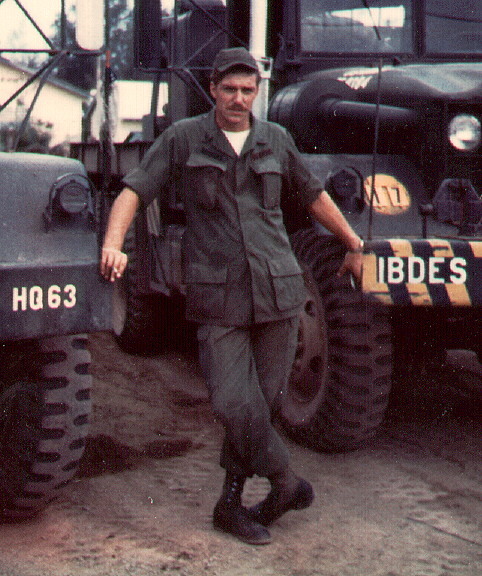 Bob Hodgkins served with the 459th Signal Battalion during the years 1970 to 1971. 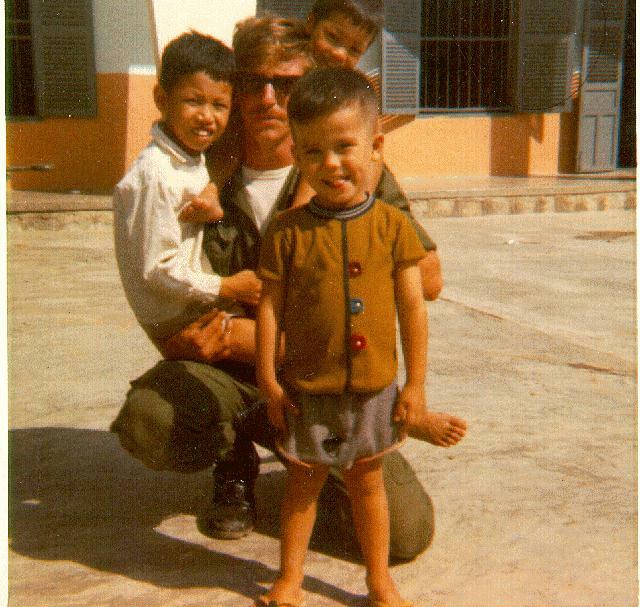 These pictures were taken at the Catholic Orphanage in Nha Trang during December, of 1970. Click on the image or on the highlighted text to expand the image. Click Here to see a much larger version of this same p icture in JPEG format, and Here for a close up of the kids and me. This is a picture of a 13 foot long King Cobra which we killed while on patrol. This cobra wa in a rice cache that we uncovered in an abandoned ville. We suspected that the snake had been put in there to ambush us, but it had been in there for a couple of days, and was not as fast at it could have been. That's me (Buddy) with my hands on my hips. Click on the picture to see this "almost" life sized. Cobras and other snakes were common in the jungles of Vietnam. Thankfully, we got him before he got one of us! There are more of Buddy's photos located Here. This is a temporary location which will be replaced with a permanent gallery in the near future. There are a couple of CH-47 "Chinook" helicopters on the strip. This strip was located near Cam Ranh Bay. This picture hows the picnic areas which have been set up for those brief periods of relaxation. She is putting out our daily laundry to dry in the sun. The living quarters in the background are typical for our base area in Nha Trang. Notice also, the sandbagged bunkers. This is a very typical scene which could be of almost anywhere in coastal Vietnam. This picture was taken in January 1971. Here is a close up of me and a couple of our "5-tons". 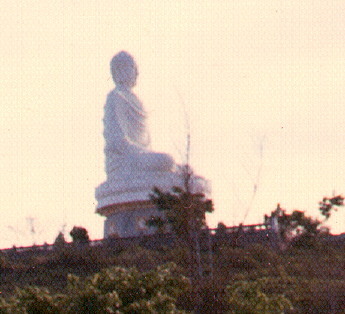 The Budda on the Mountain. This was a well-known landmark in Nha Trang. This picture is quite faded, but here you can see a Close up of the Budda . Here is another recent picture of the Budda taken by Blaine Zuver when he visited Nha Trang. Click here to view Panel #1 of Dennis's pictures in thumbnail size. Click here to view Panel #2 of Dennis's pictures in thumbnail size. Click here to view Panel #3 of Dennis's pictures in thumbnail size.